The AmpliFi HD (High-Density) Home Wi-Fi System includes a Mesh Router and 2 MeshPoints for Wi‑Fi coverage throughout your home. The AmpliFi HD system delivers maximum throughput to meet your streaming and gaming demands with lag-free performance. The Mesh Router features an innovative and simple design with an intuitive touchscreen display so you can easily check your performance and network status. The MeshPoints provide enhanced coverage to eliminate dead spots in your home. Download the AmpliFi app (iOS and Android) for instant setup and easy management. WHOLE-HOME RANGE: Robust coverage throughout your entire home. The AmpliFi system covers your entire home with a single Wi-Fi network, enabling seamless connectivity from room to room. The system is self-optimizing to ensure you always have the best connection. Mix-and-match AmpliFi Routers and MeshPoints together for ultimate coverage and customize to fit your home. INSTANT SETUP: AmpliFi replaces your current router, and works with your current modem and Internet service provider. It’s compatible with major ISPs including AT&T, Comcast, Time Warner, Spectrum, and Verizon FiOS. 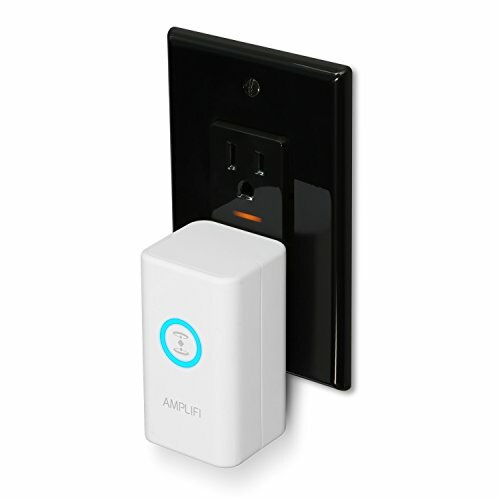 Download the AmpliFi app, plug in the Mesh Router & MeshPoints, and with a few taps in the app your network is live. INTUITIVE CONTROL: Easily monitor the status of your network, see and prioritize connected devices, and control access. Create family profiles, set schedules, or pause access to the Internet. Grant access for guests in the app without sharing or forgetting passwords. AmpliFi’s uncompromising industrial design is meant to complement your home. Show it off proudly; your router is no longer something to hide. The touch screen control means you always know the status of your connection without having to interpret confusing blinking lights like other routers. PLUG-N-PLAY HARDWARE VPN: Take Teleport with you and make any remote network part of your local home network. Get access to your streaming services and local content as if you were at home from anywhere in the world. SECURE CONNECTION: Great for working remotely or connecting on the go. From a coffee shop or hotel, your connection is encrypted. Teleport secures your Wi-Fi, to prevent hacking and online theft. NO SUBSCRIPTION FEES: Unlike subscription services that require you to download software onto each device you use, Teleport does not require any software or monthly payments. There are no limits on the number of devices connected at a time. PERSONAL VPN SERVER: Provides overrides to geo-restricted content and access. Not prone to getting blocked like popular VPN servers. WIFI TECHNOLOGY EXPERTISE: The AmpliFi home wireless system is designed by Ubiquiti Labs, a division of Ubiquiti Networks, a global leader in developing WiFi access points, WiFi antennas, network switches, Internet gateways, security cameras, VoIP phones, smart home and outdoor WiFi solutions.